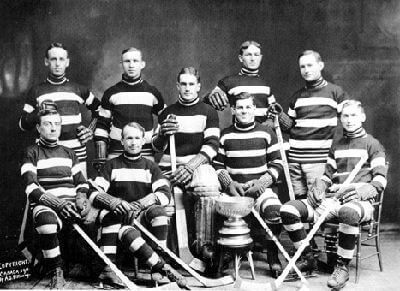 The Senators first season in the NHL, 1917 – 1918, did not go well. Salary squabbles delayed the home opener (on the league’s first night, December 19, 1917) as players protested that their contracts were for twenty games, while the season schedule was for twenty four. Enough players were appeased that the game started, 15 minutes late, while two players Hamby Shore and Jack Darragh, stayed in the dressing room while negotiations went on. The Senators lost their home opener 7 – 4. The Senators lost their previous top rival, the Wanderers, after five games. The team struggled and finished in third place after the first half of the season. The club made player changes in the second half, getting Horace Merrill out of retirement and releasing Dave Ritchie. It was Shore’s last season as he would die of pneumonia in October 1918. Shore’s last career game was in the third-last game of the season and he was sat out for the last two games. In the end, the team placed second in the second half and missed the playoffs. Cy Denneny led the team, coming second overall in scoring in the league with 36 goals in 20 games.